Slightly crunchy crust on the outside, soft on the inside. It sounds so basic, but when done right a good loaf of bread is honestly one of life’s simplest pleasures – even more if you’ve made the loaf of bread yourself. Living in Thailand, we are absolutely spoilt for good food, except for bread (and dairy). Decent bread is found at international bakeries and gourmet supermarkets, and there are some cafe’s and restaurants that make their own but they are mostly in Bangkok and Chiang Mai – both almost five hours away. For a time there we would buy as much bread as we could on our big city trips and then freeze the loaves when we got home. This was fantastic but unsustainable, after a few weeks we would be out of good bread and sad. This is when I started experimenting with baking my own bread. I started with sourdough and am literally laughing as I write this because it is such an undertaking. It was one of those ambitious, hopeful, naive moments, like the time in high school when I decided to build a clay castle for year nine art class brick by brick, but that is another story. Sourdough requires the right flour (fresh flour at that), the right temperatures and bacteria, and as I have recently come to realise, Thailand isn’t the ideal place to foster that kind of fermentation (one word: mould!!). So, I had to go a lot further backwards in my bread making journey before I could go forwards. 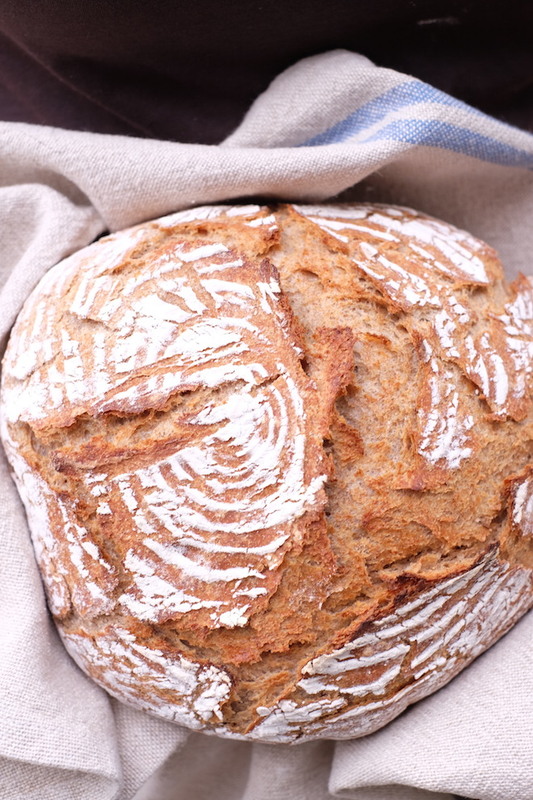 After almost 12 months of trials, frustration, and some pretty interesting results, there is only one recipe that has continued to deliver the best results for an easy everyday bread recipe. This one on the Lindy Sez site has been the winner for me. I have had to make a few adjustments here and there to account for the warmer temperature in my house and kitchen, flour quality, and kneading time. I must note that this recipe does require a Dutch oven cast iron pot with a lid but the results are fantastic and the work involved is fairly minimal. The recipe is for a no-knead bread but there is about five minutes of kneading required, so technically it’s not exactly no-knead. The rise is relatively quick (the tropical climate here probably helps), and the result is the crusty on the outside, dense but soft bread on the inside I mentioned earlier – and it’s become a staple at our home. I make it every three days and I am not lying when I say it is better than anything I’ve tasted at the shops here in Phitsanulok where I live. I follow all of Lindy’s steps in the method, except for the step where kneading is called for. I knead the bread for five minutes and then shape the dough into a ball and place it on a piece of baking paper lined with a little flour or semolina. I leave enough room on both sides to allow me to pick up the baking paper with the bread on it and drop it into the cast iron pot. I have also made a few additions and notes based on my experiments with this recipe. Her recipe is honestly fool proof and I have added all sorts of ingredients with pleasing results, like dried figs, sultanas and different herbs like rosemary. Lindy’s recipe calls for the following ingredients. 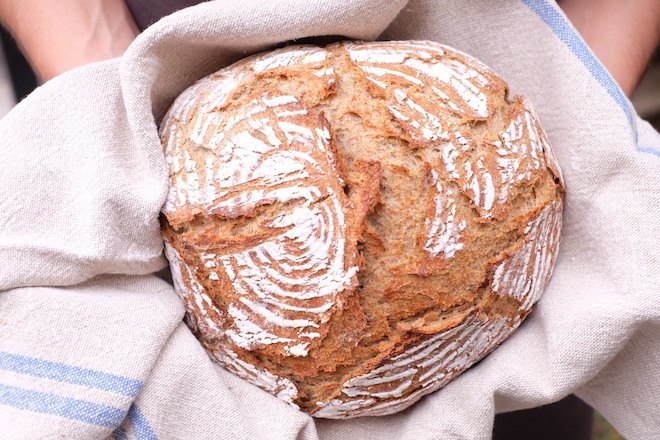 I stick to the balance of white and rye flour combination and use caraway seeds when I’m making more of a rye bread (2.5 cups all-purpose/bread flour to 1 cup rye flour). In a large bowl stir together the flour, salt and yeast. Make a well in the centre then add the warm water into the well. Mix the water into the flour until you have a very sticky shaggy dough (if the dough seems dry, add a little more water). If you are using caraway seeds, mix them in now. Cover the bowl with plastic wrap, and allow the temperature to set, by sitting the bowl in a warm place for 3 hours. I sometimes forget and leave it for more than four hours, sometimes even five hours and it doesn’t seem to effect things too dramatically. At the three hour mark, heat the oven to 450º F/232° C. Place your enamel Dutch oven and its lid in the oven and let it heat up for 30 minutes. While that’s heating, scoop the dough out onto a well floured counter with well floured fingers (I actually scoop it onto a piece of baking paper which makes it easier to drop the loaf into the Dutch oven). For no more than five minutes, knead the dough into shape (add flour if you need to), and then fold the dough over a few times until it won’t fold further and fold it into a ball, sealing the bottom into a seam. Leave it on the baking paper and place into a bread wicker basket or cake tin to allow it to rise and take shape. Once the pot and its cover have been in the oven for 30 minutes, pop your oven gloves on, remove the Dutch pot from the oven, remove the lid and then drop your ball of dough into the centre with the baking paper. Put the pot lid back on and place the pot into the oven for 30 minutes. After a further 30 minutes, remove the pot lid and return the pot (lidless) into the oven for a further 15 minutes. Remove the bread from the hot pot, and transfer to a cooling rack to cool. Keep a bread knife and some butter at the ready! Do you bake your own bread? I would love to hear about your experience with baking and any tips or recommended ingredients. Oh and if you try this recipe, please let me know – happy baking!